The humble Mini Pizza Box....these are so cute. 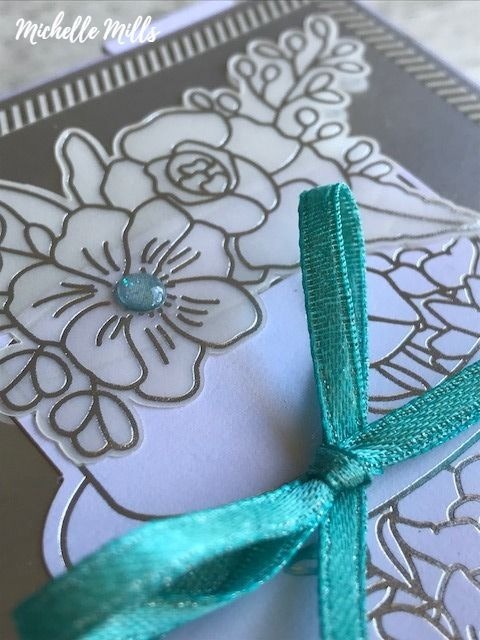 I have seen so many variations of these done in Christmas with many ideas of gifts to put inside. However, seeing as I have completely exhausted my Christmas creations, I've moved on to using new products. I purchased a pack of the Mini Pizza Boxes from the soon to be Retiring Holiday Catalogue some time back and then had no idea what to do with them. 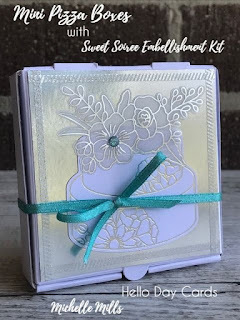 Until yesterday.....after I opened the Sweet Soiree Embellishment Kit and then decided to incorporate the two. 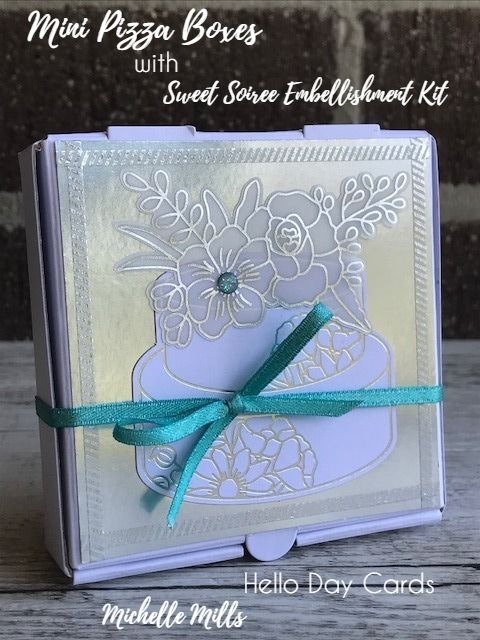 I am in love with the vellum and silver embossed flowers from this kit. They really make a project look elegant. I simply used some Silver foil for the base and the Washi from the kit to do the edging. Then adhered that to the lid. 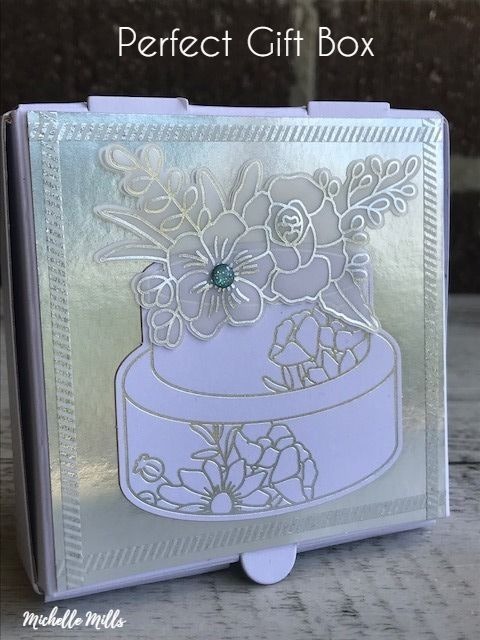 Then added the cake, with the flowers on top and wrapped in the Bermuda Bay Shimmer Ribbon from the Sale-a-bration Brochure finished off with a coordinating Glitter Enamel Dot. It even looks delightful without the ribbon. I've tied the ribbon so it can easily be slid straight off the box without untying it. 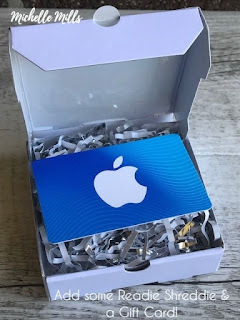 I've added some Readie Shreddie and popped in an Itunes Gift Card. These boxes are the perfect size for a gift card. 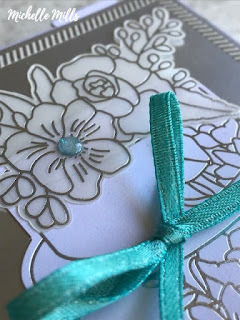 I think I'll be making more of these as now I have many ideas on variations for different celebrations. If you love the Pizza Boxes, be sure to head on over to my store and grab them as they are Retiring! Remember, new product can be purchased from January 3rd 2018.